Discussion in 'EMC Matters' started by G3TFX, Apr 2, 2017. I've been wiped out on the HF bands by VDSL interference supplied to a neighbour's property and have at last managed to trace this. As you see from the photos the overhead telephone wire first terminates in a junction box. One of the outlet wires probably feeds the wallplate in a downstairs room - the other wire looks like an ilicitly wired bedroom telephone extension tapped DIRECTLY ONTO THE OVERHEAD TELEPHONE WIRE and it is the latter that is radiating all sorts of crap. (The level is S9+ 30dB on my Yaeusu FT-847 and my antenna is a balanced fed doublet located about 11m away). Needless to say when I walk by the property with a portable receiver the noise level rises dramatically on allocated VDSL block frequencies right up to 18 Mhz. 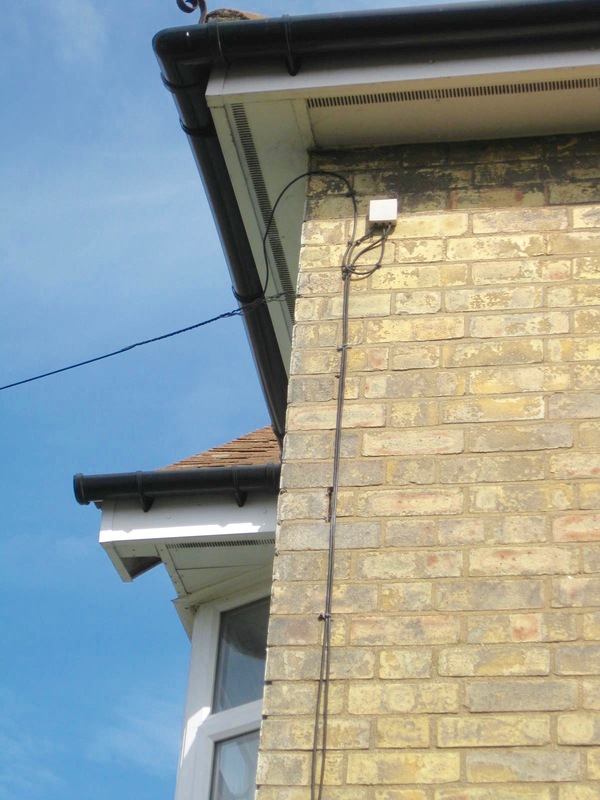 ￼ Richard Fusniak: My next door neighbour doesn’t appear to have had his VDSL broadband service installed properly by your company and the faulty installation is causing severe interference to my radio receiving station. ￼ Parveen: Hello. I'm Parveen.Thanks for that information, I'll check it and get back to you in a moment. ￼ Parveen: Hello Richard . ￼ Parveen: Can you just confirm a few bits of information so I can look into your account please? • Are you the account holder? ￼ Richard Fusniak: The details are: ***** ****** Telephone number. ￼ Parveen: Richard you need to ask your Neighbour to contact us we'll check there line and if found any issue we'll send an Engineer to fix that . ￼ Richard Fusniak: No, you need to ask them. It's not my responsiblity to confront them. Its your company’s responsiblity to ensure the telephone wire from the road goes directly to a master socket. It appears there was a telephone extension connected directly to the street line and this is illegal. It needs disconnecting to stop VDSL radio interference radiating. ￼ Parveen: Richard, the cable directly goes to main socket from exchange via green box and distribution points. ￼ Parveen: If your radio is having an issue please change channel. The cable installation doesn't cause any wireless interference. ￼ Richard Fusniak: This is not the case with next door. I have just explained that they have a telephone extension wired DIRECTLY to the incoming line and not via a master socket. ￼ Parveen: Richard one never can install telephone line without master socket. ￼ Richard Fusniak: Correct, but the line does not go directly to the master socket - the telephone extension is wired DIRECTLY TO THE STREET LINE and the broadband is radiating interference. It needs disconnecting and the customer should redirect the extension through the master socket. ￼ Richard Fusniak: Your engineers should have checked this at the time of installation and they did not spot this. ￼ Parveen: Richard let me connect you to my supervisor. ￼ Richard Fusniak: Thank you. ￼ Sandeep: Hello. I'm Sandeep.Thanks for that information, I'll check it and get back to you in a moment. ￼ Parveen has left the chat. ￼ Sandeep: Richard, the engineer connect phone line to main socket only. The customer however, can connect to the extension socket. Wired connection doesn't cause wireless interference. ￼ Richard Fusniak: Thank you. It is a technically complex situation as the customer is also complaining of pixellated video.. You may ring me if you like so I can clarify the problem on 01223 511521. The solution as I see it is to 1). Disconnect the illegally connected telephone extension. 2). Check the line balance. ￼Richard Fusniak: Are you refusing to send an engineer to check the installation which your company incorretly installed? If I have to report the matter to OFCOM this will cause unnecessary and adverse publicity for your company. I am giving BT/Open Reach the opportunity to come out and correct the situation first. Can you please confirm the engineers can do this. Thank you. ￼ Richard Fusniak: Can you also please give me an address and a contact person as I need to put my complaint in writing, Sandeep. Please include your phone number, email address and account number. ￼ Sandeep: Thanks for contacting us on chat. Take care of yourself and have a good day. So, to sum up BT's effective attitude. * We don't deal with complaints by strangers. * If you get VDSL interference you are imagining it. * Our connections don't cause wireless interference. * Why don't you stop moaning and change channel. * Get stuffed. Have a good day. OK Richard No1 mistake to get in touch with their so called technical help line at BT. What you need to do in the first instance is to email John Rogers M0JAV who is the chair of the EMCC who looks after VDSL complaints. He will send you and online form to fill out and once he has received it back will submit it to Openreach who will do some remote testing of the line to your neighbour and with those results they will rectify the problem, normally high resistance connection to the overhead cables causing the system to be unbalanced. We here at the EMCC have been doing this for a while now which has been published in the EMC page in RadCom and also here on the forum. Yes, I am going down that route Ken. I have no idea whether my neighbour has the right type wallplate suitable for VDSL or whether BT Openreach will even bother to find out. It seems the company now allow customers to self install. 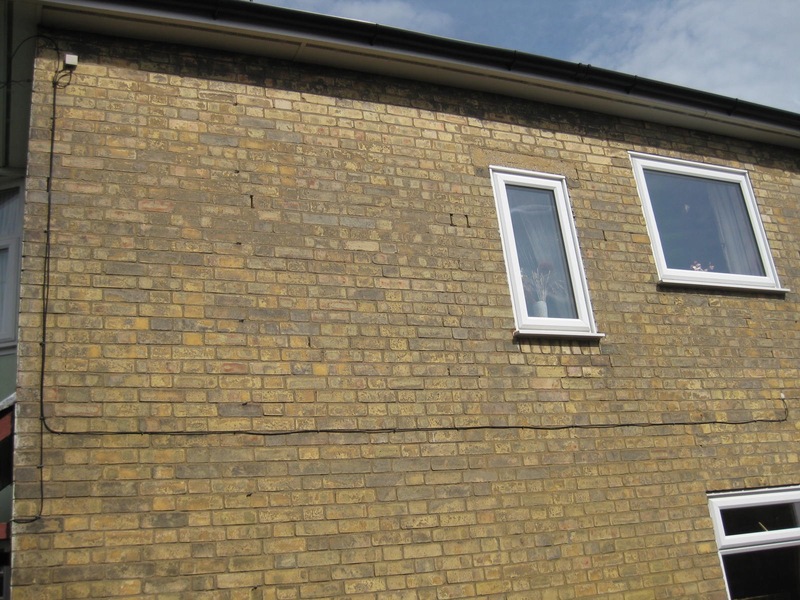 Fat chance of my neighbour saying the will be delighted to pay for a Managed Engineer Install when they are not even aware of a problem as yet. I was interesed to read case law of Rylands v Fletcher involving the escape of water causing damage to an adjacent property. Do unwanted escaping RF radiations that cause a nuiscance fit into a similar bracket? Food for thought. Richard why waste time in thinking about what your neighbour has got or has not got, until you get some involvement with Openreach then things will not change one little bit. Get in touch with John Rogers and get the ball rolling, he is the only one who has direct contact with Openreach as you have direct experience in trying to contact them your self. with the supportdesk (XS4ALL) as they have no idea, what you are talking about. can do more, to solve the problem, which started after Dutch Telecom Company (KPN) upgraded the line from VDSL to VDSL2. but makes no real sense. SNR is just 6DB (see enclosed screenshot) and provider says, that's oke, it's working as long as it is not below 5DB. I suspect the line which comes from the basement straight up to the appartments causing this problem and seems to work like a vertical antenna. Tuning 20 watts already cause errors on the line and after some minutes of errors, the line disconnects. It is mainly on 40 and 20 meter. Getting there is difficult, I think, so the provider is not waiting to solve my problem. Hi Robert, thank you for posting your comments about our mutual problem. Hi Ken, thanks for reply. Well, as said in previous message, I still suspect that the telephone line from down the basement and which comes up to the 4th floor, works like a vertical antenna. As I cannot measure, how long the line really is, I guess that it must be around 10 meters, which is a 1/2 wave on 20 meterband. Together with a nearby HAM, who had approx. similar problems (but also instable line without transmitting) and lives in an appartment as well, I am trying to find the solution at my appartment. His problem was solved after 9 months of investigation by the TelCom company. They extended the line (cable from Belden, which we cannot find at the internet unfortunately) in his house with 15 meters and he calculated that the total line in the building is now approx. 35 meters. Maybe we are thinking a bit simple about the problem, but if we extend the line (shielded DSL cable 2-pair) with e.g. 25 meters F=300 ((10mtr+25mtr = 35x4)x1.06) is 2.021 MHz which is just outside the amateur bands. The only difference is, that his appartment is at the 2nd floor and further away from his antenna than I am. It will be a matter of testing, I think. Any thoughts and suggestions are more then welcome. Hi Robert, it does not matter if the phone line is vertical or horizontal if it carries any type of RF it will radiate locally, maybe if it is close to resonance on an amateur band then then slightly more so. I would like you to contact John Rogers M0JAV direct and give him all the details as he is concentrating all his efforts on VDSL problems here in the UK. Thanks Ken, have immediately sent him an e-mail.